LONDON — March 19, 2019 — Automata, a new kind of robotics company, today announced $7.4 million in funding, fueling the launch of Eva, the first-ever desktop robot for industrial use. Now available to order from the Automata website for £4,990, Eva is specially designed to be lightweight, user-friendly and accessible, while maintaining industrial quality performance. Led by Hummingbird Ventures, with firstminute Capital, Hardware Club and previous investors including LocalGlobe, ABB, and Entrepreneur First participating, the series A round is being used to continue the expansion of their growing team of 42, based out of the company's headquarters in London, as well as supporting the increased production of Eva. "Mostafa and I started Automata to democratise robotics and to ultimately allow anyone to seamlessly use a robot. We are extremely proud to offer Eva at the price point we do. People can visit the Automata website and buy a piece of industrial quality equipment on their credit card - it doesn't get much more accessible than that," said Suryansh Chandra, co-founder of Automata. "This recent funding allows us to bring Eva to an increased number of businesses across multiple sectors." With accessibility at its core, Automata has designed a powertrain called AutomataDrive that includes a proprietary gearing system - as well as a software program called Choreograph. The tailor made gearing system allows for both the price point and set up time to be substantially reduced from what would typically be days to just a few hours, serving as key points of differentiation from others in the space. Choreograph also invites greater use of integration, with its 3D programming capabilities, animation-inspired interface, and flexibility to run on any web-enabled device. This opens robotics up to manufacturers doing short production runs, in order to adapt to seasonal demands as well as offer high degrees of customisation. "Suryansh and Mostafa bring a visionary perspective to robotics and an endearing determination to turn the traditional manufacturing model on its head by fostering a new dimension of productivity, whilst simultaneously lowering the costs for developed and high-labour cost countries," said Barend Van den Brande, Founding Partner at Hummingbird Ventures. 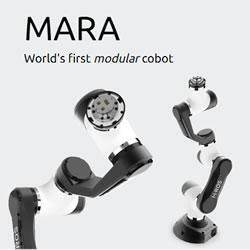 Produced by leading UK robotics manufacturer Tharsus, Eva is equipped to empower anyone - whether it be factory workers and manufacturing engineers at SMEs, or those at bigger operations driven to innovate specifically by enabling menial tasks to be automated, Eva ultimately invites greater productivity and a more rewarding working environment for employees. Early customers have used Eva in various capacities, from testing touch screen functionality in automobile dashboards to loading and unloading parts into production lines , over the course of several months. "Automata is a company making fundamental changes in the robotics space," said Robin Klein, Co-founder and General Partner at LocalGlobe. "By offering an industrial quality, lightweight robot capable of being set up and operational in a matter of hours, Automata is encouraging businesses to embrace automation like never before." To date, Automata has raised $9.5 million, with earlier round investors including ABB Group, LocalGlobe, Entrepreneur First, Innovate UK and angel investors Joe White and Wendy Tan, VP of X (Alphabet).